Evelyn is really a trooper - even though it obviously isn't fun to have surgery, be in the hospital, be all doped up for days, learn how to breathe through a new little hole in your neck, etc - she wasn't fussy when she woke up, she didn't seem scared, she just seemed a little grumpy. I personally would probably be a LOT more than grumpy. 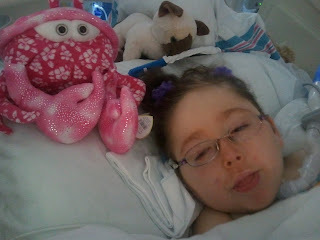 I continue to be so thankful that she is able to communicate; seeing her understand as much as she's able to the reasoning behind this surgery and hospital stay, and being able to exert small bits of control like choosing a movie - I know that those things make this experience much more bearable for her. There was a time when Daniel and I felt very skeptical about Evelyn's level of 'cognition' - a long time actually. I know that some reading this haven't really experienced Evelyn's talking firsthand, or have seen her on a bad day, or a sleepy day, and may doubt her ability. Well, all I can tell you is that there is no skepticism in our heads or hearts anymore. In large part, that is because we've seen her respond too well too many times to doubt her. The other factor is that far too many independent professionals have worked with her and seen the same things. Now, don't get me wrong - I'm not saying Evelyn is a rocket scientist, and I don't have unrealistic or even specific long-term goals for her intellectually - I just know that right now, she is a very typical almost-five-year-old in her mind and in her heart. She knows her shapes, colors, letters and other preschool stuff; she knows how she's feeling and what she wants, she knows who all the people in her life are and how she feels about them, and she understands why she's in the hospital and what she needs to work on to go home. I'm not sure why this post went in this direction, but I suspect it is because it is hard for people to believe without seeing. It seems easy for many to have faith in God, or in themselves - so why is it sometimes hard to have faith in a child? When someone we love seems not to 'get' Evelyn it hurts; and often it is just a matter of time and circumstance. Evelyn isn't 'in action' all day long every day - she's too medically complicated for that - but she's in there. The idea of a lack of faith is applicable in so many situations where special needs are concerned. There is a big difference between being in denial and being realistically hopeful - and I believe that the moment I say something is impossible, it becomes unattainable for my child. I was talking to our nurse tonight, because she was asking about Evelyn - and I said that though I would be extremely (and pleasantly) surprised to see Evelyn walk someday, that I would absolutely not say that she never will. It would be a surprising accomplishment for her, given the many physical issues she faces - but if I believe that it will NEVER happen then it won't. We don't live our lives daydreaming about miracles, or imagining Evelyn to be someone she's not - we live very much in reality - watching her have seizures, struggle to breathe, spend way too much time in the hospital. We face the reality of a shortened lifespan, of continued trials and problems, both medical and otherwise, and we face the reality of looks, comments and a gross lack of understanding from the general public. The reality is that Evelyn is super-complicated, and that includes her brain, which is all mixed up structurally, but works just fine for thinking, thankyouverymuch. Thank you for sharing! I didn't think your post was crabby at all. Most of us have no idea what it is like to have a child with lots of medical issues and the only way we can gain any understanding is from parents like you and Daniel who are willing to share.